World's most popular messaging app Whatsapp recently got an update i.e message read confirmation update. It simply means that now the double grey tick marks will turned into blue. The above snap shot show the new update. Whatsapp is updating very fast first double Grey Tick Marks, second Last Seen and as it was now enough to ruin your relationship third update these Blue Ticks Marks. It simply means that the message is been read by the receiver and in case if you are the receiver and if you wouldn't been able to reply them at a moment. Then you know what can happen :P ( Specially in case of girl friend ) ! The pressure to reply the message might be greater if someone knows that you had already read the message. So instead of all that I have founded one trick to " Hide the Blue Ticks" ! Even I was facing the same problem and that's why I invented this trick and it's working very fine. 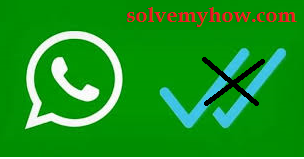 How to Disable Blue Ticks in Whatsapp OR How to Hide Blue Ticks in Whatsapp ? Step 1 :- When you're online on whatsapp or on your lock screen. Don't open the message directly. Let them come, You just wait for a while ! Step 2 :- Go to setting >> Switch off >> Use Packet data or Disable WIFI connection ( if you're connected to wifi ) ! Step 3 :- Now, Open Whatsapp and read the conversation. Step 4 :- Exit from Whatsapp and Turn ON your Internet (Use Packet data) or WIFI Connection. This is it. By doing this trick, It won't send any message read confirmation to the other user (means it won't turn grey tick marks into blue). I have tested this trick on my Android Phone and on the receiver side it was Iphone. So, its working fine for Android and Iphone. Do test it for other devices and OS and do let me know in the comments below, Whether this tricks works or not. Yes seriously man like that's why I wrote the line "Blue Tick Marks, as last seen was not enough to ruin your relationship" !